Human Foosball | FroggyHops.com Minneapolis MN. 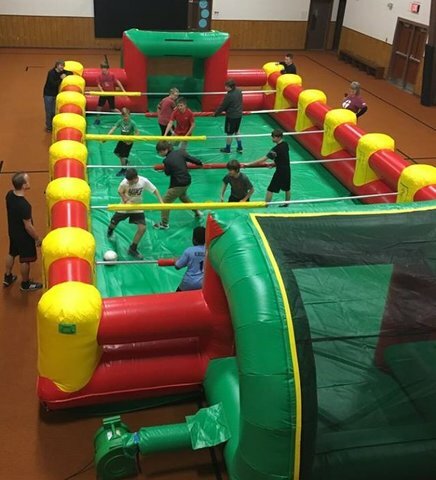 The Human Foosball Inflatable Game is a life-size version of the famous table-top soccer game known around the world! 6-10 Players participate at once by gripping one of the easy-release handles. Players are able to move horizontally but remain attached to his or her flexible rod creating a fun and entertaining team experience for the players and viewers alike! Two large enclosed goals stand at each end to keep the ball in play and maximize the competitiveness! The Human Foosball Game is suitable for outdoor indoor or outdoor play. A floor cover is available to protect floors from scuffs and provide a finished green-grass appearance. The floor cover is optional, but comes included at no additional charge. Players provide their own ball. Team up with this phenominal team-building popular inflatable foosball game! Human Foosball is perfect for sports teams, company meetings, corporate events, and more!